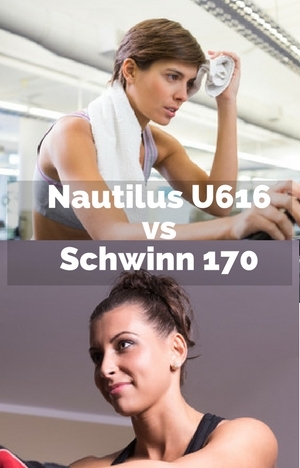 This Nautilus U616 vs Schwinn 170 comparison puts these bike alongside each other to see how they match up. These bikes look just a little different but do have similar features. They are supplied by the same company which explains some of this. But there are a few other differences between the two bikes. There is the price difference of course. And in this post I look at whether the differences justify the price. But before detailing the differences here is a quick review of the bikes. This bike has the better looks and styling (so I think) – I like the white support poles. The computer console has more modern look to it as well. There is plenty of variety with the pre-set programs to help you stay interested and match to your goals and fitness ability. The 25 levels of magnetic resistance goes from easy to hard so it can be set to the level you want. The levels increase incrementally and movement between them is smooth. The pedaling motion is smooth too, so it gives a low impact experience that is easy on the joints. There are 4 user profiles that allows you to track performance for each separately. The dual displays provide you with lots of feedback as you workout to keep you on track and see how you are getting on. It also allows you to still see measures when you use the media tray which covers the upper display. Customers like the quality of the bike with it being compared favorably with gym quality bike. Read more in my full review here. This is the most popular upright exercise bike at present. It packs in a lot of similar features as the U616 but at a more affordable price. It comes with a 13 lbs flywheel, belt drive, 25 levels of magnetic resistance and 29 workout programs. It can be used by a range of people from complete beginners to those looking for a more demanding workout including indoor training for cyclists (it’s not going to give very demanding training for very fit individuals but it can help maintain and improve cardio fitness when you can’t get outside). It is compact and can fit into most homes without overtaking a room and it can be moved on transport wheels if you want to put it out of the way. The differences between the bikes are highlighted and described here to provide the information that can be key to deciding between the two. There is listing of the features side by side below that allow you to see a full comparison at a glance between the two bikes. These differences can help to decide where each bike is better for you depending on your goals and by looking the features each offers and the differences. BlueTooth. The U616 has bluetooth capability which allows you to upload your workout data for the 4 users up to their accounts or app accounts rather than using the USB stick. You can still use the USB stick method if your prefer – this is the only way you can do it with the 170. Fitness App. The U616 works with the Nautilus Connect App where as the 170 doesn’t have an App. This is for uploading your workout information but doesn’t give any more options for use with the bike itself. Weight. The U616 is 6.2 lbs heavier at a total weight of 68.6 lbs due to its slightly larger size and construction which is why people find it a quality constructed bike. Dimensions. There is a slight difference in dimensions with the U616 being bigger. It 2 inch taller, 0.2 inch wider and 1/2 longer. This will give it a little more stability than the Schwinn 170 and the estra inch that it caters for in the height of users. Maximum User Height: The U616 caters for people another inch taller with going to 6 ft 2 ins. For me you are paying quite a bit more for a bike that is slightly better put together and looking that comes with bluetooth and a Fitness App. The Nautilus U616 will probably give a slightly better ride and feel a little more stable. You can also upload your workouts to a fitness app using bluetooth. This does save some work in using a USB stick to do this with as you have to do with the Schwinn 170. Customers to date have on the whole think they got a good bike that gives them a smooth workout and is well constructed which is reflected in the ratings and popularity. From the feedback from the supplier the Nautilus U616 will stand up better to standing on the pedals and riding it more like an indoor cycle but it’s not designed for long periods out of the saddle. The App does allow you to check on things with your phone that you can’t with the 170 which you can only do on your account and myditnesspal.com. It doesn’t provide you with any more programs or a better way to control your bike. I think with the price difference of $160, for the extra features and quality, that the Schwinn 170 looks the better deal is the one I’d go with. Unless you want to be out of the seat and standing for long periods and then you may better off with an indoor cycle or spin bike but they do come with less features. In the table below is the features, specifications and dimension for both bikes listed side by side to give a full idea of how they are alike and where they differ too. Hopefully you now have the information you wanted and have decided on the right bike for you. It would be great to hear what your thinking is on this.